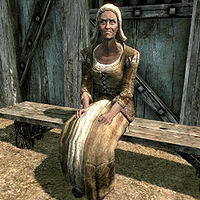 Olava the Feeble is an elderly citizen and a seer who lives in her house behind Breezehome in Whiterun's Plains District. She has a dark secret and will provide you with a very special reading, pointing you to an assassin of old. Olava gets out of bed every morning at 6am and immediately heads up to the Bannered Mare for a three-hour breakfast. At 9am she heads back to her house and sits down on the porch where she relaxes for ten hours. At 7pm she enters the house where she strolls around until her bedtime at midnight. She wears a belted tunic, a pair of boots, and a hat. She is equipped with an iron dagger, and carries a key to her house, as well as a selection of lower-class items and gold. Should you approach her, Olava will be quick to reveal her powers to you: "Maybe some other time I'll reveal your destiny, hmm? Tea leaves, palm reading, crystal scrying... Oooh! Maybe trepanning? Ha ha ha ha." and "Come to Olava for a reading, did you? Sorry, pup, but I'm not quite in the mood." Thinking that you may not believe her, she will then assure you that she can see into the future: "Oh, I tell the future, all right. When I feel up to the task, that is. But I'm afraid my energies haven't quite peaked yet today." When giving you the Dark Brotherhood quest Breaching Security, Gabriella will promise you Olava's Token as a bonus, saying "Do that, and Astrid has authorized me to grant you a rather unique bonus. It is a special token, to be given to Olava the Feeble, in Whiterun. Olava is an old and dear friend, and a powerful seer. The token entitles you to a reading of your future. It's an opportunity one should not pass up." Talking to Olava when you have her token will have her say: "Token, you say? Let me see. Oh, goodness me. You're a friend of Gabriella's, then. Well, I guess we both know why you're here." If you ask her for a reading, she will respond: "Hmph. Yes. Yes, I surely can. It's not something I do lightly, mind you, and it's not as specific as you might want. But yes. I will do this for you. Please, relax. Free your mind. Yes, that's it..." She will then look into the future and share it with you: "There's a cave. No, not a cave. A... home? A place you feel secure. You will find safety there... sanctuary. I see snow, lit by the star of dawn. And you are not alone. There are others. A child of night... a stalker of the sands? Oh, but before you are family, there will be blood. Such blood. Wait! There's something else... A potential for adventure, and wealth. It is a ruin, ripe for the plunder. Deepwood Redoubt. Far to the northwest... Through there is... Hag's End. The last resting place of an assassin of old. A Dark Brother, who bequeaths his ancient earthly possessions... to you." She will then stop, and you can encourage her to tell you more: "No... no, that is all. Now... now please. I find myself very weary all of sudden." The quest Locate the Assassin of Old will then initiate. If you approach her again, she will say: "By Sithis, but you are a persistent one. Haven't I told you enough? ", implying some very strong, but unexplained, ties with the Dark Brotherhood. Locate the Assassin of Old‎: Find the Dark Brotherhood Assassin. The future she reveals hints at an event that occurs in the Dark Brotherhood. If that event has already occurred, she will instead say: "Your destiny is dark. Oh yes, so dark. But much of it has been fulfilled. You have found sanctuary, and the comforting words of a mother's love. And you have companionship. A child of night, and a stalker of the sands. Together, you are a family. ", before starting the quest. According to an unused line of dialogue in game data, Olava was able to give you a reading for 5 gold, saying: "Oh, very well. But my energies are low. I warn you - I won't be able to see much. Give me... five gold, and I'll do what I can." However, it is not possible to get a reading this way, so her farewells are unused as well: "May all your possible futures be bright." and "Please, leave me to recover my... mental energies." According to the Smugglers' Note, Olava is apparently in league with the Khajiit trade caravans, and her status as seer is being used as a cover of some kind. On Tirdas and Turdas, Olava was supposed to listen to the ramblings of Heimskr between 3pm and 7pm. However, her bench package always takes precedence. In Breaching Security, Olava's Token is required to receive a fortune reading from her. However, it is not a true quest item and may have been discarded or sold by accident. This page was last modified on 20 October 2013, at 23:49.